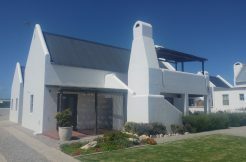 Stand for sale in Jacobsbaai in the West Coast of South Africa. South East facing on the magnificent bay of Jacobsbaai itself. Close to “Die Weskusplek” Restaurant. Enough to build a typical west coast house as seen on photo’s on the 302 sqm plot. No time limit to build. Strict West Coast building guidelines.